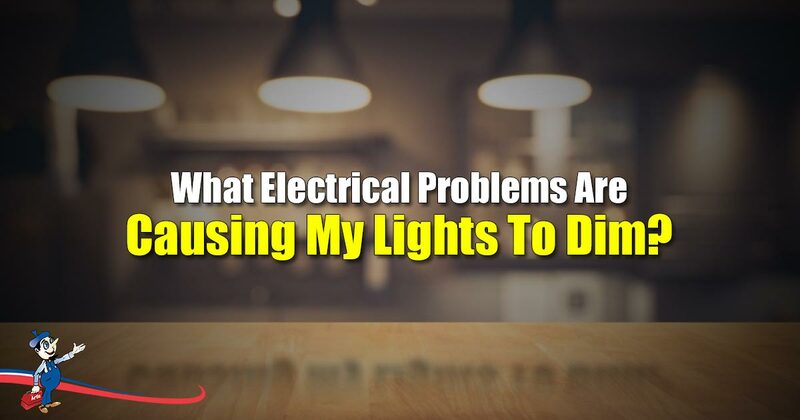 Home » Plumbing, AC & Electric Tips » Electrical » What Electrical Problems Are Causing My Lights To Dim? Having flickering or dimming lights is an annoyance that most people write off to a mis-connection or faulty light bulbs. Realistically, your lights may be dimming for a number of potential electrical problems; however, the main cause of dimming is when there is a sudden increase in the load on your circuit. A question your electrician may ask you is if the lights have always dimmed or if they are increasingly dimming as time goes on. This is a very important question as it can give an indication of where the problem may lie, so take note. For any problems concerning electrical work it is best to call a trusted electrician as electrical work can be dangerous if you do not know what you are doing! A wire connection may loosen over time, this may cause your lights to dim more than previously experienced. This problem will mainly present itself in the warmer months of the year when electricity is at a higher demand thanks to furiously running AC units, rather than in the cooler months when demand is lower. It is best to call an electrician for this problem and get it fixed as soon as possible as loose wires can create a high resistance, which in turn can lead to a fire. If your lights dim when plugging in an appliance such as an iron, it could be because the appliance itself is not working properly. It is best to get the appliance repaired before it can harm you, such as by shocking you, or it may be even cheaper to replace the device! Electrical circuits have changed over time, in newer homes lights don’t share the same circuit as plugs in older homes where plugs and lights shared the same circuit. When a new appliance is plugged in, especially ones that draw in more electricity when they are switched on than when they are running, the demand of the circuit increases, and this can than cause your lights to dim. To fix this problem, call an electrician who can install dedicated circuits as one solution to this problem. Another problem that can occur in older houses is that they cannot keep up with the demand of electrical current that newer forms of technology need. For example, some devices such as laptops use a lot more electricity than before, and there are often multiple devices like this in a single home – this is known as the electrical drain. If your electrician deems that this is the problem, they can provide a service upgrade to your home’s circuits. Due to wear and tear of appliances over time, things such as lights will not always produce the same quality output. As light bulbs are used, and wear and tear kicks in, the light bulbs will produce less and less light. When this happens, it is recommended that the light bulbs be replaced. If your lights are continuing to dim for a long period of time and there is no pattern that you can see causing this, it may be best to call your electricity company (i.e. FPL). They may not be supplying at the norm you are used to due to an issue on their side.